A note from The Ladey: I am very sorry and have to apologize to all the participating cats and those of you who have been patiently waiting for this week's Carnival of the Cats. All I can say is: life happened again. The kids handsome man got sick with the flu and some other nasty infection and I was there to help him and see he is ok and additionally I was trying to catch up and reschedule my calender and had to squeeze in his meetings at work as well, so no deadlines would be missed and he can recover safely. Like Mom Robyn pointed out to me: I am a perfectionist and so the carnival got delayed again rather then just throwing in some links and doing a "quick roundup". Sorry my friends! Monica remembers MAKI, the kitten in the picture above. Unfortunately it already left for the big adventure at the Rainbow Bridge. There was a green-eyed neighbour spotted last week at the Elms in the Yard. What a beauty!! At This, That and The Other Thing Cubby and the others of the Gang are enjoying the new scratching post. Texas Oasis has some Unidentified Feline Ovals... Go find out more! This handsome kitty named Ted is featured at The Poor Mouth. ME would love to know more about this handsomeness! Diamond Emerald Eyes shows wonderful graphics for Wordy Wednesday. A thoughtful and conscientious Mancat should always help with the household chores. And this is exactly what Sir Tristan Tabby Cat Longtail does best! Cece has not been visiting Miz Mog for a few days but now he is back demanding his tem-tay-shuns. Kismet is a very helpful kitty this week hekping his human to set up the new PC. What would the humans do without our help. huh? Miss Scarlett says: "Cat Rule #7: Always accompany guests to the bathroom. It is not necessary to do anything. Just sit and stare." Awwwww, did you ever see a more handsum and thoughtful mancat? Miz Mog thinks Meowza is just sleeping but ME finks he is the most thoughtful mancat ever!! Don't miss our lovely friend Luna: She is a movie star this weekend! Cute kitten pics and a birthday to celebrate: The LOST kittens are having their 2nd Birthday! ME says HAPPY PURRRFDAY!! Fracas and Rocky were busy helping their human artist. Life as a cat sometimes is sooooo hard! Maddie and Ivy have won one of the prizes from last weeks CotC. Concatulations! Miz Lizzie is relaxing, good plan sweetie! Shadow the Queen of the Panther House cats gives us a glimpse of some of her many kitty faces. Denali at Kitty Kitty - is playing with her food. Well, who would not like to play with such lovely foodz? As she says "it tastes so much better this way"! ME agrees! 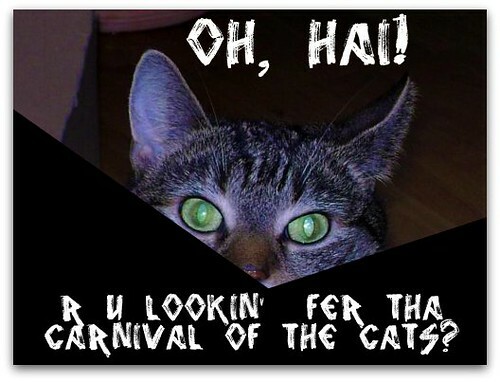 This ends this weeks Carnival of the Cats! We hope you had fun! A nice collection of cat pictures! Fanks for coming and snuggling me Othello. I'm sure that's what's helping me feel better, not Aunty Biotiks. I'm feeling a bit better and want my treats now. It may have been late, but it was worth the wait! Excellent Carnival - thank you! Wonderful carnival Salome. You did good, it was worth waiting for. Thanks for including my girl Shadow.